Injured in an 18 Wheeler Crash? Some of the most catastrophic traffic collisions in Louisiana, and around the nation, involve tractor trailers and 18 wheelers. Considering their sheer size and weight, these big rigs can cause life-threatening injuries and death when they collide with passenger vehicles. The average 18 wheeler tips the scales at more than 32,000 pounds – over six times the weight of the typical automobile. In 2015, the number of fatalities associated with 18 wheeler accidents rose 22 percent compared to 2009, reports the Insurance Institute for Highway Safety. Whether attributed to driver fatigue, improper cargo loading, or impaired driving, motorists who are injured in such accidents deserve the right to pursue fair compensation. Victims are often faced with a long road to recovery, extensive hospital bills, and the prospect of long-term physical disabilities in the wake of an 18 wheeler accident. When these crashes and injuries are caused by negligence, the law provides recourse for victims and their families. If you were hurt or lost a loved one in an 18 wheeler crash in Louisiana, you need a reputable attorney who has successfully litigated big rig accidents, and isn’t afraid to go after insurers. At the Bart Bernard Injury Lawyers, we leverage the technical expertise, resources and experience to handle commercial truck accidents efficiently and effectively. With convenient Baton Rouge and Lafayette office locations, our legal team offers aggressive personal injury representation for injured victims throughout Louisiana. 18 wheeler accident lawyer Bart Bernard stands committed to balancing the scales of justice, and works tirelessly to maximize recovery for all losses incurred, including past and future medical bills, property damage, lost wages, physical and occupational therapy, emotional suffering, and other damages. Get the compensation you rightfully deserve by entrusting your case to a highly dedicated attorney, whose sole focus is your physical, emotional and financial recovery. Bart Bernard’s talent in personal injury law has earned him several professional accolades, including membership in the Multi-Million Dollar Advocates Forum and the Elite Lawyers of America. His practice is characterized by unrivaled client service, attention to detail and impressive legal strategies that deliver the best possible outcomes for his clients. When litigating 18 wheeler truck accident claims, you need a highly experienced attorney who will handle all legal filings, deal with insurance adjustors and assure that your best interests are always protected. 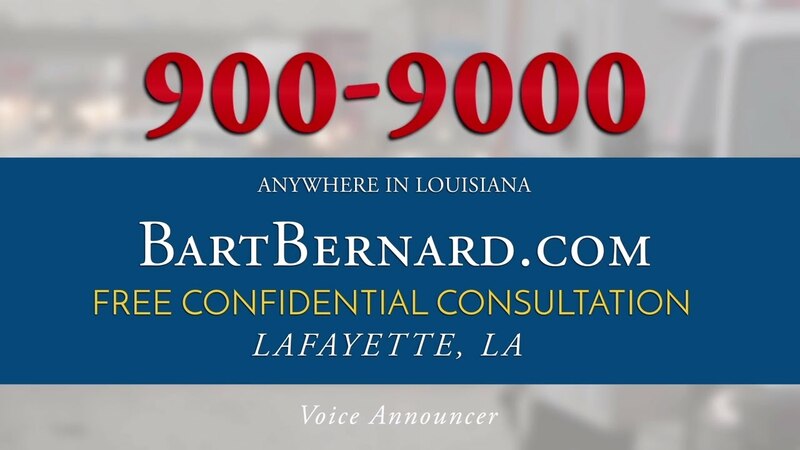 Attorney Bart Bernard is well-versed in state and federal regulations that govern the trucking industry and works with a large team of medical experts, accident re-constructionists and engineers to build the strongest case possible. Through meticulous fact-finding and investigations, his team can establish liability and demonstrate the full extent of injuries suffered. Your choice in legal representation makes a world of difference; partner with a Louisiana personal injury lawyer with a proven track record of procuring big payouts for clients. You never have to settle for less than you deserve after suffering the misfortune of a tractor trailer crash. If settlement negotiations are not to client satisfaction, Bart Bernard is prepared to try your case before a jury. Most headlines about serious 18 wheeler accidents include at least one fatality. Those who do survive their injuries are often burdened with the effects of missed work, pending hospital bills, extensive rehabilitation and the prospect of long-term health complications. Given so much at stake, it pays to work with an 18 wheeler accident attorney who can ensure you have access to the best medical treatment until your claim resolves. Attorney Bart Bernard has the legal savvy, determination, compassion and financial resources to fight for justice in an 18 wheeler accident claim. His practice is borne out a deep-rooted commitment to helping injury victims recover, while holding negligent parties accountable for their wrongdoings. The Bart Bernard Injury Lawyers is proud to have successfully secured high value settlements in many serious accident cases. We handle 18 wheeler accident cases on a contingency fee basis, meaning you owe nothing if we are unable to win compensation on your behalf. Protect your rights to compensation by setting up a free case review. Call today if you live in the Lafayette, Lake Charles or Baton Rouge areas.